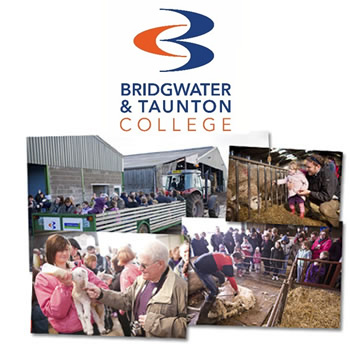 Bridgwater and Taunton College’s Rodway Farm is based in Cannington, Somerset and is one of the leading providers of agricultural training and education. The College’s Rodway Farm is based in Cannington, Somerset and is one of the leading providers of agricultural training and education. The 180 hectare farm is home to a herd of 250 Holstein dairy cows and 250 ewes. The opportunities are endless but to name a couple: come and visit the new born animals or take a tour of the state of the art milking parlour. The College Farm is a commercial operation which currently extends to over 180 hectares, providing arable, pasture and conservation areas, while being home to a number of specialist livestock enterprises. The milking parlour, which opened in 2008, showcases the latest technology in which up to date recording and computerised monitoring systems enable maximum reproductive and nutritional performance from the herd. The Holstein milking herd operates at 250, producing an average of 9,500 litres per day. The sheep enterprise currently consists of two hundred and fifty ewes of a variety of different breeds crossed with Texel rams. Lambing takes place at the end of February through to March to produce finished lambs during the summer and early autumn. A small beef enterprise operates with a range of different breeds to enable comparison of growth rates and carcass classification. These currently include Aberdeen Angus, British Blue, Charolais, Hereford, Holstein and Limousin. The land currently utilised for arable production has a cropping rotation programme in which spring wheat and maize are grown, together with Italian rye grass and red clover. The farm owns a full range of modern equipment used to undertake farm related operations such as ploughing, drilling and mowing, fertiliser application and harvesting. In recent years, over £10 million has been invested in improving the facilities at our land-based centres and the resources for land-based training are now considered to be among the most exceptional in the country.